Coconut oil is considered to be the best natural oil to eat and cook with and and is an important source of natural fats for the body which is important for healthy brain funtion and cellular function as each cell in the body has a membrane made of fatty lipids. The reason that coconut oil is healthier than other oils is that it contains short and medium chain fatty acids and is high in lauric acid. This makes it more stable and so it is not altered by heat and is therefore recommended for cooking. Unstable fatty acids can cause inflammtaion and disease in the body. We use coconut oil in some recipes but our main use of coconut oil is in our green smoothies. They consist of water, kale, banana, pear, LSA and coconut oil. This drink ensures that we get a good dose of coconut oil to help get our healthy fat intake and to regulate healthy blood sugar levels. Melrose Organic Coconut Oil (butter) is a pure natural, virgin cold pressed Coconut Oil. This is a organic virgin cold pressed coconut oil which is produced within one hour of opening a coconut by villagers using the Direct Micro Expelling (DME) process. This oil retains the natural aroma and flavour of coconut. 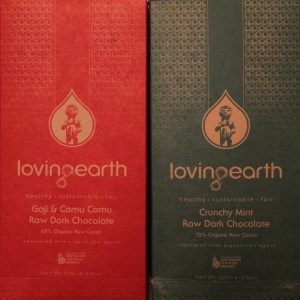 I can’t get enough of this Raw Organic Dark Chocolate from Loving Earth. My favourite is the Crunchy Mint and it is a great chocolate fix after dinner or at anytime of the day. You can be assured that the benefits of the dark chocolate are passed on to you because the ingredients are not heated over a temperature which destroys the enzymes. I really believe that this chocolate is actually good for you. It contains no dairy, wheat or soy or refined sugars. Organic raw cacao butter, Organic raw cacao powder, Organic agave syrup (dark), Organic cacao nibs, Peppermint oil, Himalayan crystal salt. Organic raw cacao butter, Organic raw cacao powder, Organic agave syrup (dark), Organic goji berries, Vanilla beans, Camu camu, Himalayan crystal salt. Trying to eat healthy doesn’t need to mean no treats at all, right?? 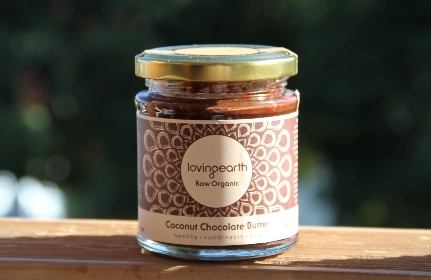 Well, that’s what I have discovered with the Coconut Chocolate Butter from Loving Earth. In my household we are doing our best to keep away from processed foods and instead we are incorporating a predominately raw, healthy food lifestyle. Thank goodness raw chocolate can be part of the equation! This delicious and healthy product is made from pure raw ingredients which means all the goodness is kept because it has not been heated over a certain temperature. The taste may be quite strong for some so I do recommend to eat in only small amounts at first. This may also be all you need at times because it does seem to satisfy any chocolate cravings quickly. The main component of this great product is organic coconut oil which is considered to be one of the healthiest oils. It is also a very stable oil with a high melting temperature which means this product will be quite hard (but still edible) if stored in a cool area. Organic raw coconut oil, organic raw cacao powder, organic raw agave syrup (dark), Himalayan crystal salt. 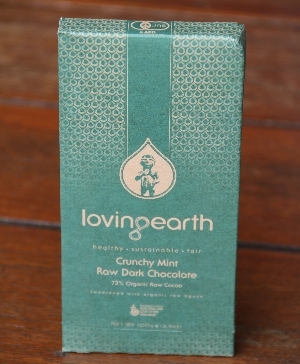 Are you a maker or distributor of a natural, organic product and want it reviewed on www.organicreviews.com.au? Please contact me via the contact form as I would love to help out.